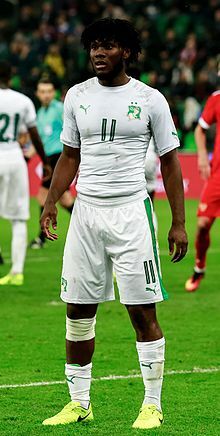 Franck Yannick Kessié (born 19 December 1996) is an Ivorian footballer who plays as a central midfielder for Serie A club Milan and the Ivory Coast national team. Born in Ouragahio, Kessié began his career in Stella Club d'Adjamé, joining their youth setup in 2010. In 2014, he was promoted to the first team. On 29 January 2015, Kessié signed a three-year contract with Serie A club Atalanta. He was assigned to the club's Primavera squad upon his arrival, and contributed with seven appearances for the side. His first match in Europe occurred on 1 March, as he started in a 2–0 away win against A.C. Milan Primavera. On 18 April 2015, Kessié was called up to the first team for a match against Roma, but remained an unused substitute in the 1–1 draw the following day. On 26 August 2015, Kessié joined Cesena in the Serie B on a one-year loan deal. He made his professional debut on 26 September, coming on as a substitute for Antonino Ragusa in a 0–0 away draw against Perugia. Kessié scored his first professional goal on 31 October 2015, netting the last in a 2–0 home win against Virtus Lanciano. He became an undisputed starter afterwards, appearing in 37 matches and scoring four goals as his side missed out promotion in the play-offs. After returning from loan, Kessié was promoted to the first team by manager Gian Piero Gasperini. After appearing with the main squad during the pre-season, he made his debut for La Dea on 13 August 2016, starting and scoring the last in a 3–0 Coppa Italia home win against Cremonese. Six days later, he renewed his contract until 2021. Kessié made his debut in the main category of Italian football on 21 August 2016, as he started and scored a brace in a 4–3 home loss against Lazio. He scored another goal seven days later, in a 2–1 away defeat to Sampdoria. Kessié subsequently became a mainstay in Gasperini's starting eleven, scoring the winners against Torino (2–1 home win) and Roma (2–1 home win), both through penalties. He also scored the equalizer against Empoli on 20 December 2016, with Marco D'Alessandro scoring a last-minute winner. On 2 June 2017, Kessié joined fellow Serie A side Milan on a two-year loan deal with the obligation to buy. Originally, he chose 19 as his shirt number but soon was persuaded by the club's management to leave it for Leonardo Bonucci, who transferred to Milan a few weeks later; as a result, Kessié changed it to 79. Following Bonucci's departure in the next summer transfer window, he was offered his original shirt number back yet refused, citing that he does not want to force A.C. Milan fans to spend any extra money on his personalized shirts due to yet another number change. He made his debut for Milan and helped the club to win the first leg of Europa League qualification match against CS U Craiova on 27 July. On 20 August 2017, in Milan's opening Serie A match of the season, he scored a penalty in a 3–0 victory over Crotone. In a match on January 21, 2018, Kessié scored two goals, one being from the penalty spot, to give A.C Milan the win. Kessié represented Ivory Coast at under-17 and under-20 levels, appearing in the 2013 FIFA U-17 World Cup and 2015 Toulon Tournament. During the former tournament, the Royal Moroccan Football Federation submitted a complaint to FIFA claiming that Kessié was aged 22 and not 16; FIFA later denied that claim. At the age of 17, Kessié played his first international game with the senior national team on 6 September 2014, starting in a 2–1 home win against Sierra Leone for the 2015 Africa Cup of Nations qualification. On 4 January 2017, he was included in Michel Dussuyer's 23-man squad ahead of the 2017 Africa Cup of Nations, starting in all matches as his side was knocked out in the group stage. When Kessié was 11 years old, his father, a professional footballer in his youth who later joined the Ivorian army, died due to illness. Therefore, one of his goal celebrations is a military salute performed in order to pay tribute to his late father. That is a peculiar celebration that is unique to him. ^ "Stella Club: Kessié signe à l'Atalanta Bergame" [Stella Club: Kessié signs with Atalanta Bergamo] (in French). Afrik-Foot. 30 January 2015. Retrieved 25 March 2017. ^ "Atalanta, 22 convocati per Roma: prima per Kessie" [Atalanta, 22 called up for Roma: first for Kessie] (in Italian). Calcio News 24. 18 April 2015. Retrieved 25 March 2017. ^ "Kessie è un giocatore del Cesena" [Kessie is a Cesena player] (in Italian). A.C. Cesena. 26 August 2015. Retrieved 26 May 2016. ^ "Perugia–Cesena 0–0, tensioni dopo la gara" [Perugia–Cesena 0–0, tension after the match] (in Italian). Umbria On. 26 September 2015. Retrieved 25 March 2017. ^ "Il Lanciano gioca bene ma perde a Cesena per 2 a 0" [Lanciano play well but lose to Cesena by 2–0] (in Italian). Il Centro. 31 October 2015. Retrieved 25 March 2017. ^ "Atalanta, Gasperini scopre il jolly Kessie, ivoriano che sogna Yaya Touré" [Atalanta, Gasperini discovers the wildcard Kessie, Ivorian who resembles Yaya Touré] (in Italian). La Gazzetta dello Sport. 18 July 2016. Retrieved 25 March 2017. ^ "Alla Dea basta un tempo: 3–0" [To Dea one half is enough: 3–0] (in Italian). Ecco di Bergamo. 14 August 2016. Retrieved 25 March 2017. ^ "Franck Kessie rinnova fino al 30 giugno 2021" [Franck Kessie renews until 30 June 2021] (in Italian). Atalanta B.C. 19 August 2016. Retrieved 25 March 2017. ^ "Atalanta 3–4 Lazio". Football Italia. 21 August 2016. Retrieved 25 March 2017. ^ "Sampdoria 2–1 Atalanta". Football Italia. 28 August 2016. Retrieved 25 March 2017. ^ "Atalanta 2–1 Torino". Football Italia. 11 September 2016. Retrieved 25 March 2017. ^ "Atalanta 2–1 Roma". Football Italia. 20 November 2016. Retrieved 25 March 2017. ^ "Atalanta 2–1 Empoli". Football Italia. 20 December 2016. Retrieved 25 March 2017. ^ "Official: Kessie is now red and black". A.C. Milan Official Site. 2 June 2017. Retrieved 2 June 2017. ^ "Ivory Coast's Franck Kessie joins AC Milan from Atalanta". 2 June 2017 – via www.bbc.co.uk. ^ "Kessie, Cutrone, Suso in form as Milan begins Serie A campaign with win". ESPN. 20 August 2017. Retrieved 29 August 2017. ^ "CM U17 – Scandale, Franck Kessié (16 ans) aurait 22 ans" [U17 WC – Scandal, Franck Kessié (16 years) 22 years old] (in French). Espoirs du Football. 30 October 2013. Retrieved 25 March 2017. ^ "Cote D'Ivoire 2–1 Sierra Leone: The Elephants toil to overturn lead". Goal.com. 6 September 2014. Retrieved 8 Sep 2014. ^ "Afcon 2017: Wilfried Zaha in Ivory Coast's final squad". BBC Sport. 4 January 2017. Retrieved 25 March 2017. ^ "MILAN, KESSIÉ E L'ESULTANZA DA MILITARE: UNA DEDICA AL PADRE" [MILAN, KESSIÉ AND THE MILITARY GESTURE: A DEDICATION TO FATHER]. Goal. 21 September 2017. Retrieved 22 September 2017. ^ Franck Kessié at Soccerway. Retrieved 25 March 2017. ^ "Franck Kessié". National Football Teams. Benjamin Strack-Zimmerman. Retrieved 25 March 2017.